There are several very important reasons for setting a task to do commercial duct cleaning regularly. The key reason for commercial duct cleaning is to secure great indoor air quality. This fact alone leads to extending the lifetime of your HVAC system by reducing household dust and, ultimately, save energy and money. Indoor air pollution is a critical health and environmental threat to people. Most people do not realize that airborne contaminants are being drawn into the duct system, which evidently causes harm if not treated. Over a period of time, these harmful contaminants build inside air ducts. These contaminates include soot from traffic and energy production, dust mites, mold, chemicals, airborne allergens, and animal dander. Once these contaminants circulate throughout your home office, or commercial building, they may cause adverse health effects to you and everyone that sets foot inside the building. Lifa’s dry removal method is extremely suitable for commercial buildings. Our fast, efficient, and proven cleaning methods result in short cleaning times. This minimizes the disturbance for the business and people. Lifa’s commercial cleaning systems not only include office buildings, retail outlets and hotel resorts, our cleaning services are also available for small residences as well. We are able to inspect, clean and coat any duct size with our specially designed Lifa Air tools. Our trained professionals have used LIFA certified equipment to secure clean and safe air in more than 50 countries around the world. Our experience is your benefit! Our extensive experience from thousands of completed projects is for your benefit. From that experience, we have discovered advanced methods that help you to accomplish your cleaning projects much faster, more safely and with better cleaning results. The widest range of brushes, innovative brush adapters and gears makes your work effective no matter the complexity of your project. Not to mention, our reliable vacuum collectors and snappy telescope lifts for vacuum hoses. Their rugged and ergonomic design secures low running costs and makes your duct cleaning business profitable. We have designed various sets for all kinds of applications. 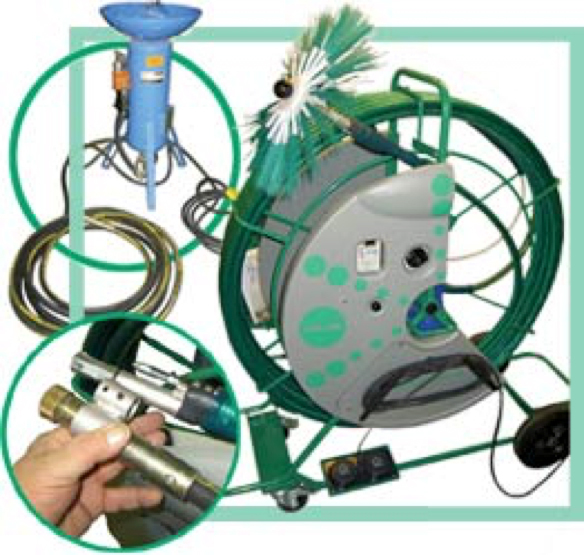 Our kits are a turnkey solution to complete your project including inspection systems, brushing machines, brushes, vacuum collection machines, vacuum hoses, and accessories.